18.03.2019: Blancpain GT Series - Announcement BLACK FALCON return to the Blancpain GT Series Endurance Cup in 2019 as the defending champions with a pair of Mercedes-AMG GT3. 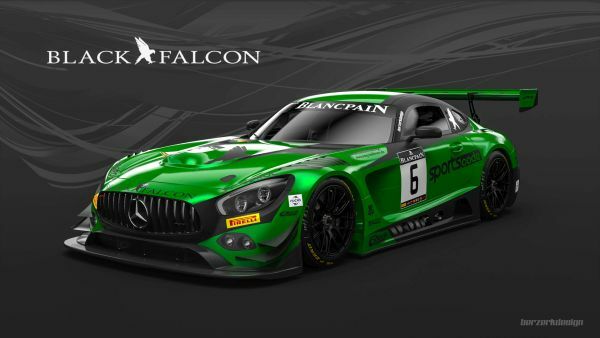 BLACK FALCON return to the Blancpain GT Series Endurance Cup in 2019 as the defending champions with a pair of Mercedes-AMG GT3. The team will compete in all five rounds of the long-distance racing series, which includes the mighty challenge of the Spa 24 Hours in July. Additionally, BLACK FALCON enters one car into the renamed Blancpain GT Series Sprint Cup for the first time in the team’s history. The Pro class #4 Mercedes-AMG GT3 will star the defending champions and team veterans Maro Engel (Germany), Yelmer Buurman (Netherlands) and Luca Stolz (Germany), race winners all who bring a surfeit of skill and speed to #4. Engel and Stolz will also compete in the Blancpain GT World Challenge Europe, the sprint-format series that sits alongside the long-distance Endurance package, in an effort to add the overall Blancpain GT Series title which is awarded to the driver(s) with the best combined results from the Sprint and Endurance Cup. In the Silver Cup, Hubert Haupt (Germany), Abdulaziz Al Faisal (Saudi Arabia) team up with Patrick Assenheimer (Germany) for their 2019 effort in the #6 AMG GT3. Hubert and Abdulaziz are long-time Black Falcon drivers who narrowly missed out on the class title last season which shall find its way to Meuspath this year. Although Patrick is new to the team in terms of the Blancpain series he brings a wealth of experience to the driving strength and knows the car from last season when he raced the AMG GT3 in the ADAC GT Masters and the VLN. Excellent performances at the pre-season test, held at the impressive Circuit Paul Ricard in the south of France, mean that BLACK FALCON go into the new season brimming with confidence. Maro put his BLACK FALCON AMG at the top of the timesheets on the first day, while Patrick and Abdulaziz steered #6 to be fastest in Silver Cup, setting a time less than a second off their Pro team compatriots. The season opener of the Endurance Cup will take place in about one month on the weekend of April 13th and 14th in Monza, Italy. Last year, Buurman, Engel and Stolz laid the foundation for the eventual championship win by finishing third on the high-speed track in the north of Milan. Al Faisal and Haupt were also on the podium in the Silver Cup thanks to their second place finish. In 2019, the Blancpain GT Series features ten events on Europe's most famous circuits. The championship is divided into two disciplines, each with its own standings: The Blancpain GT Series Endurance Cup, which consists of a 1000km race, three 3-hour races and the legendary 24-hours race at Spa, and the Blancpain GT World Challenge Europe, which runs two one-hour races on each of five race weekends. In 2019, BLACK FALCON will compete as defending champions of the Endurance Cup team and driver championship and extends its commitment to the World Challenge Europe sprint discipline to compete in the Blancpain GT Series overall championship. For all training sessions, qualifying sessions and races, a extensive live streaming service including live timing is available on the official Blancpain GT Series website, YouTube and Facebook channels.